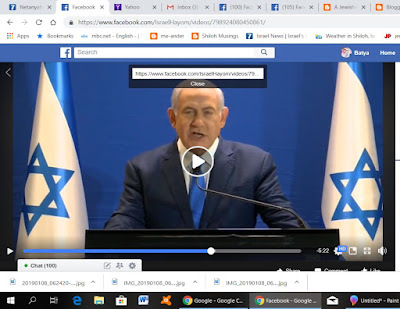 Last night before 8pm Israel Time, I hurriedly tried to find a link to listen to Prime Minister Bibi Binyamin Netanyahu's "important announcement." About a week ago, there had been a similar situation from Naftali Bennett, and that's when he and Ayelet Shaked told us all that they were leaving NRP-Jewish Home and officially starting their own political party. So, unlike those on facebook who were making jokes out of Bibi's possible "news," I thought maybe he was going to announce that a dynamic, charismatic vote-getter would be joining Likud. I was wrong. A very tired and uninspired looking Binyamin Netanyahu just kvetched that the "judges were against him." He wanted the opportunity to confront his accusers. To be honest, knowing my criminal law more from American television, than anywhere else, I agree with him. But I don't see this as suitable material for a big public announcement. How many times had he been called in and interrogated by the police? This wasn't a chance to tell his side of the stories?? And if we choose to believe him, he has nothing to say because there is nothing. This dramatic announcment was a big nothing. because they pull Jews apart”. leave permanent or habitual homes. no legitimate claim on the land of Israel. Considering the years, efforts and worse that have been wasted trying to find something illegal, maybe they should give up and declare Bibi innocent.